Nepal has had special memories for me. I practically spent every summer there since I was ten with my cousins and the entire extended family and loved it. There was nothing more special than watching rented movies (No DVD age and thank god for that!) and munching on home-cooked popcorn with mugs of hot chocolate and the anticipation of waking the next morning and visiting Pokhra or Bakthapur. We also spent freezing winters there, away from the sweltering heat of Bombay, till the time that Nepal became almost a second-home to us. My aunt is Nepalese and hence we visited Nepal a lot. This review in the sense of the word is dedicated to the country which I in all likelihood never visit again. Nothing to Declare is a great book though. It consists of 16 short stories and each one – you guessed it right! – is set in Kathmandu or parts of the capital. When an entire book is centred around a city/country, it kind of makes the reader wonder a little about the places and can get a little confusing, however over a period of time while reading it, the reader gets used to the style and involved in the book. That is what happened to me with this one. I love short stories, however the more different one is from the other, the better. 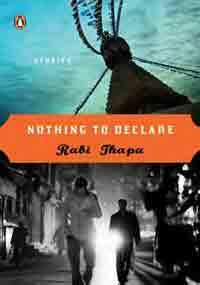 Nothing to Declare is one of those books that make you wonder after you are done reading it. Rabi Thapa’s stories are descriptive, bold and try to break the mould of what Nepal stands for – conservative, conscious and ever-judgemental society. For instance, the title story deals with Bikram, who wants to leave the city and imigrate to London. Then there is the tale of Young foreign returned Nepalis in “Night Out in Kathmandu” and how they deal with the experience of return. They eat, sleep, share tales with the ones’ who did not leave, who did not get the opportunity to leave. The stories provide an insight to the country and what it is also going through currently – for instance, in “Home for Dashain” – the Maobadis think they can make decisions on behalf of the people, which they do and it doesn’t end too well. At the end of it all, the book resonates in your head. The voices are lined with individuality and want to be heard. Rabi Thapa introduces you to the country like no other writer. For me it was a journey back in time. I identified the places, racked my head and heart for memories and found them all. This entry was posted in Books, Fiction, Penguin Books, penguin india, short stories and tagged Nepal, Nothing to Declare, penguin books, penguin india, Rabi Thapa, stories on May 22, 2011 by thehungryreader.